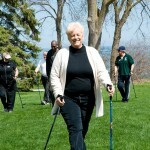 Walking poles are very beneficial to anyone who is going to use it, especially seniors. 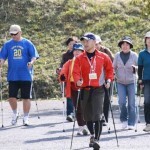 Seniors who are using walking poles in various walking activities, such as hiking activities for seniors, can really find it easier and better to balance and walk, compared to doing various walking activities without the use of any walking poles. Walking poles are commonly used to help in adding support and balance, however, walking poles are also commonly used to help in relieving pressure in the lower extremities and evenly distributing the impact as a person walks. To gain the most from your walking poles, you need to know how to choose the right walking poles and how to properly measure walking poles. 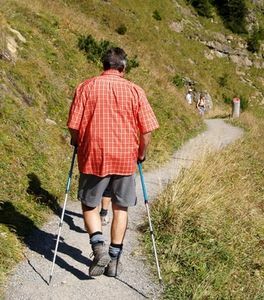 Walking poles should be of the right length and size according to the user’s height. Too short walking poles used by tall people can really be uncomfortable and it will also be difficult to use. 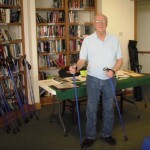 Walking poles can come in a fixed or one-length walking pole or adjustable walking pole. No matter what type of walking pole you are going to use, just make sure that the length of your walking pole can put your elbow at a 90-degree angle when in use. Keeping your elbow at a 90-degree angle can help in providing better stability and balance during various walking activities. 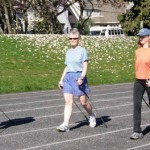 The 90-degree angle of the elbow while using walking poles will only apply when used on a flat or level surface. 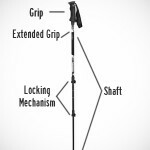 However, if you are planning on using your walking poles during hiking activities in mountain trails, then you will have to shorten the length of your walking pole by several inches when you are walking uphill. Adjusting the length of your walking poles several inches shorter when walking uphill can provide you with better leverage and balance. If you are walking downhill, you will not also maintain the length of your walking pole just like when you are walking in a flat surface. When walking downhill, increasing the length of your walking poles for a few inches can help in providing more balance and stability. Always make sure that the length of your walking poles should not make your back bend down. Always keep your back straight to prevent straining your back muscles, and keeping your back straight all the time can also help in maintaining your balance. How to Properly Measure Walking Poles?